With 2015 Dakar Truck category winner Ayrat Mardeev behind the wheel, the 900 horsepower, 10-tonne Kamaz 4326 had to crawl through London traffic on its way down to the south coast – with a little stop off at Harrods to pick up a souvenir. 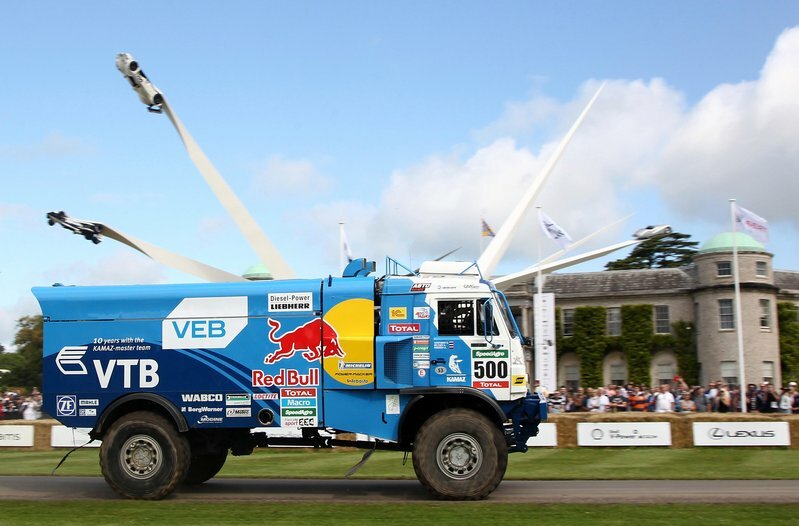 Go on the road to Goodwood with the Kamaz in the video below. Things didn’t get any easier when Ayrat left the city behind him, either, with the Kamaz having to battle low hanging branches, tight country lanes and some bovine roadblocks before he could arrive at the legendary motorsport event. Go on the ride with Ayrat and the Kamaz in the video above – then enjoy his run up the Goodwood Festival of Speed hill climb course in the video below. © 2010 - 2017 Kamaz Int'l Trading FZE. All rights reserved.